Head to the largest live rock music venue in the heart of the Old Quarter for a paradise of cocktails and heavenly Belgian beers. This is the hippest place to be in Hanoi with 4 to 5 rock bands performing weekly, themed parties and DJ’s. Those looking for a drink with a view should visit this stylish and modern bar. It also has the reputation of going the extra mile to ensure a more personalised service. 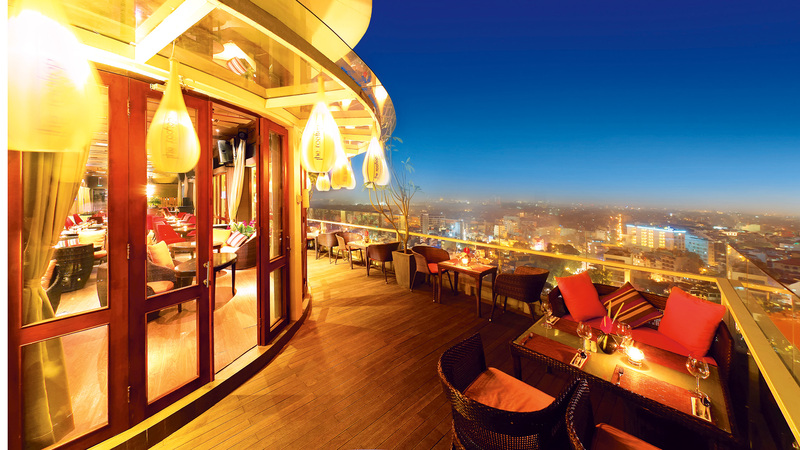 The highest open air brasserie & bar in Vietnam, Top of Hanoi, is located on the rooftop of Lotte Hotel Hanoi. Breathtaking 360 degree views of the city, stylish decor and trendy ambiance all make this new venue the place to see and be seen. Located in the historical part of Hanoi, La Plume tells you beautiful stories about Vietnamese culture. The stunning decor is inspired by the design of the legendary Long Bien bridge. La Plume is a hotspot for all day snacks and evening drinks. Awesome cocktails are mixed by Vietnam’s champion Pham Tien Tiep, whilst the wine list is comprised of an impressive 450 labels. Executive chef Dao Van Son who has worked with many Michelin starred chefs, prepares authentic snacks using local organic and imported products. Items on the menu range from European to truly Vietnamese specialties. Tucked away just outside the backpackers’ area of Hanoi, on a street lined with five-star hotels and office buildings, The Rooftop on the nineteenth floor of Pacific Place is a high-altitude oasis with magnificent views of the city’s skyline. Established in 2010, The Rooftop is one of the most charming bars in Hanoi. The chic and stylish interior, inspired by New York City’s many bars and lounges, makes it the go-to place for professionals to meet and greet or unwind after a long day’s work. Even better is the outdoor terrace, where the view of the city centre from high above will awe residents and visitors of Hanoi alike. On bright sunny days, looking at the colourful and vibrant city will make you feel relaxed and refreshed, while at night, the city lights and cooling winds create an atmosphere you won’t easily forget. This is perfect for an escape from the hustle and bustle of urban life. An extensive list of drinks makes sure the night is complete. Don’t forget to try the signature Tiamo cocktail, beautifully made with a combination of delicate fruity flavours and a powerful punch to it. They also have many popular cocktails such as Mai Tai and Long Island Iced Tea, selected draught beers and a separate menu for champagnes. With a growing reputation for excellent parties, The Rooftop is a must for anyone visiting Hanoi with partying in mind. 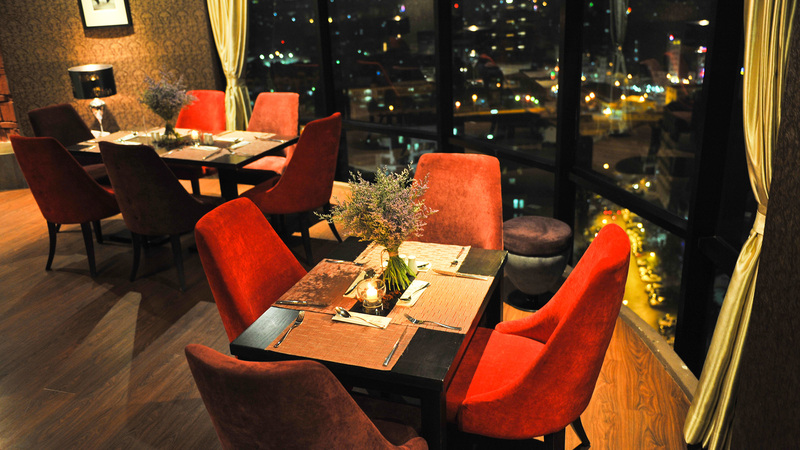 It also offers breakfasts, lunches and dinners that bring Southeast Asian delicacies to a new height. Couples, groups of friends and families can all find their fixes here. Corporate patrons can also book the entire venue for special events during the day or night. The Rooftop’s happy hour is from 5 p.m. to 8 p.m. every day, and they also hold a Ladies’ Night every Friday, where all female guests are treated to a free drink. There is no better way to see a city than by towering above it, and The Rooftop is by far the best option in Hanoi for anyone who wants a touch of class, a dash of party and a well-mixed cocktail while enjoying the unique view. Choose an outdoor table for the full awe-inspiring experience.